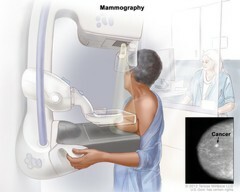 Mammography; the left breast is pressed between two plates. An X-ray machine is used to take pictures of the breast. An inset shows the x-ray film image with an arrow pointed at abnormal tissue.